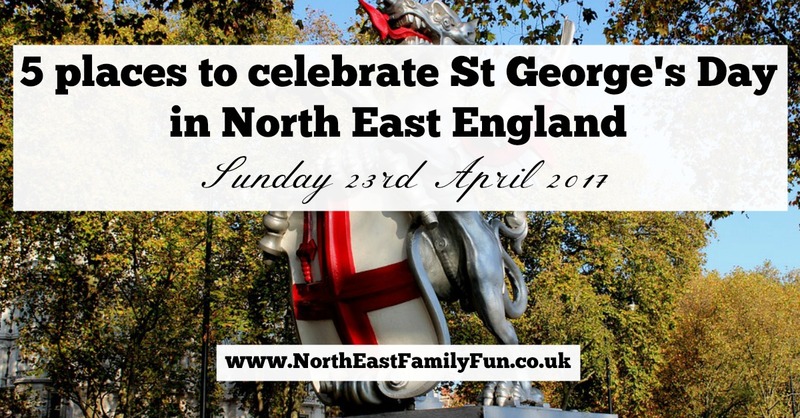 St George's Day falls on Sunday 23rd April this year and I've found a few ways you can join in with the celebrations around the North East. The first mention of St George was recorded by venerable Bede in Northumberland around 673 AD and by the early 15th century, St George's Day was a major celebration in England, en-par with Christmas Day in fact. By the 18th century (and after the union of England with Scotland), celebrations weren't quite so grand but there are still places where you can celebrate today and modern traditions include wearing a red rose on your lapel, Jerusalem will be sung in Cathedrals and Churches and local pubs may be decorated with the St George's cross. It is also tradition to tuck into traditional English food - bring on the Sunday Roast! A St George's Day Pageant will take place at Warkworth Castle on 22nd & 23rd April from 11am - 5pm. The event is included with regular admission (and free for English Heritage members). Join medieval townsfolk and musicians as they celebrate with performances and demonstrations. A mysterious Knight in shining armour and his famous foe, the dragon will also be making an appearance! Join Newcastle Castle for their St George's Day Family Celebrations on Sunday 23rd April between 11am and 4pm. The clock will be turned back to medieval Britain and there'll be the chance to watch the man himself ride around the castle (stopping for photos of course), costumed characters, medieval food, combat, crafts, demonstrations and more. Watch out for the dragon though! No pre-booking required, standard admission applies. Join in with the St George's Day Dragon Dash at Gibside. Join in the fun and get dressed up as a dragon and run past historical buildings, ruins and through meadows. The dash begins at 9:30am and there's a prize for the best dressed! Then from 11am, you can create your own St George's Day flag or join in with a spot of cricket. There is a fee for joining in with the dash (call 01207 541 820 for details). Regular admission applies. Where better to celebrate St George's Day than at a proper English pub with a pint. We've visited a few cracking family-friendly pubs recently and would recommend The Northumberland Arms in Felton, The Stables at Beamish Hall and The Broad Chare in Newcastle as proper pubs you can get a decent pint and Sunday lunch with the family. Join the crafting team and create your own St George's Day craft to commemorate the day. This event is included with regular garden admission and will take place on 22nd and 23rd April 11am - 4pm. All materials are provided. Some good ideas there. Do you know if they are planning anything at Hylton Castle in Sunderland?